You talked, we listened. New size limit per file is 50MB, and there is a maximum of 10 files per user. If you want to upload an 11th file that’s fine, but we’ll remove the first one. There’s also a limit of 50Mb for the total size of all input files selected as inputs per manipulation. Sejda now supports pdf files that require a password. When we detect a protected pdf file we will ask for the password to open it in order to continue. Sometimes it’s handy to reorder the files to be merged after they were uploaded. We added drag and drop reordering to the merge parameters screen. We found and fixed few bugs related to stability of the background task processing. 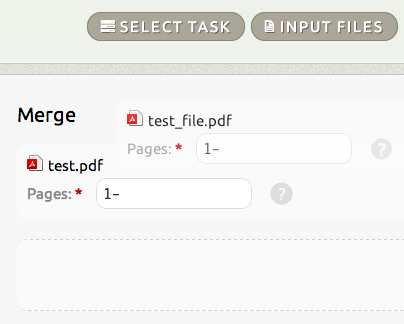 Tasks should run faster now, and on the Results screen there is an indication of how many others are waiting for their pdf files to be processed together with you. Forms were simplified, we removed some settings related to the pdf output that were not used much. The main manipulation forms are now cleaner and hopefully easier to use. Hope you’ll find Sejda better and as usual, let us know how we can make it even better!